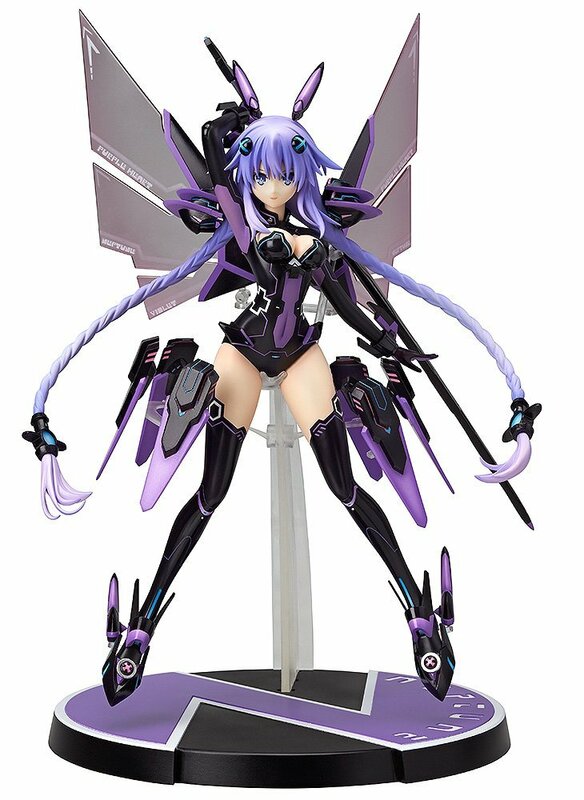 This figure of Neptune's Purple Heart HDD transformation was released just recently in December in 2015. It was published by Wing. Neptune is the only character from Hyperdimension Neptunia whose name is not based on a color and also the only character that is based on unpublished console-Sega Neptune. This completely pre-painted PVC figure is sculpted by Shinichi Aoki. Without her weapon accessory this figure is 24 cm (approx. 9.4 inches) but when the weapon accessory is added her height increases to 32 cm (around 12.50 inches) . Her weapon is not the only bonus goody you get with this figure. With it you will also get a special base which enables you to display Neptune as if she were floating. Another interesting bonus is her processor unit which provides an ability of altering its the position and angle. If the processor unit is a bit much for you don't worry it is completely removable.